You can now apply for 2018 UCAS Conservatoires courses on our website. To apply on-time for a music course, we must receive your application by 2 October. If you're applying for dance and drama courses, you must submit your application by 15 January. Here are five things you need to do to apply. The best place to start is our search tool. If you’re not sure which conservatoire or course is right for you; we’ve got lots of great advice. Try attending an open day to get a taste of conservatoire life, as it gives you the opportunity to meet the tutors, speak to current students and check out the campus. When you’re ready to start your application you need to register. All you have to do is answer questions about yourself and create a password. Once you’ve done that, you’ll be given a username. Make sure you keep a note of your login details so you don’t have any problems at a later date! Each section must be complete before you can send your application. There’s lots of advice on filling in your application on our website. When it comes to adding your qualifications, enter every place you’ve received a formal qualification from in the ‘Education’ section. This should start from the age of 12 onwards. You can search for your schools by clicking on the ‘Add a school/college’ link and then select the ones you’ve attended. If the school isn’t listed, just click on the ‘My school/college is not listed’ option which will allow you to enter the details in manually. Once you’ve done this, add your qualifications in the ‘Qualification’ section. Similarly to the Education section, you need to search for the course type. If the qualification isn’t listed, find the different options for ‘Other’ and select the most relevant one to enter the details manually. When you get to the personal statement we’ve got some great tips on what to include. The application fee is £24, which you pay with a credit or debit card. If you need to pay by an alternative method, such as a bank transfer, you can send us your application without the payment. 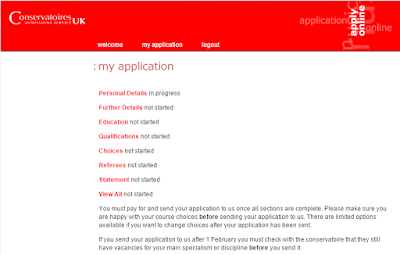 However, you must send a payment to us within 14 days of sending us your application, otherwise it’ll be cancelled. Each conservatoire will have an audition fee – you can pay for this when you send us your application or by bank transfer if you’re going to pay at a later date. Some conservatoires may waive the audition fee but you need to discuss this with them. It’s important to arrange your payments as soon as possible as the conservatoires can’t make a decision until you’ve sorted your application AND audition fees for all courses. After your application has been sent and the fees have been paid, the conservatoires will get in touch with you about auditions. All updates will come from the conservatoire and they’ll also be in Track. 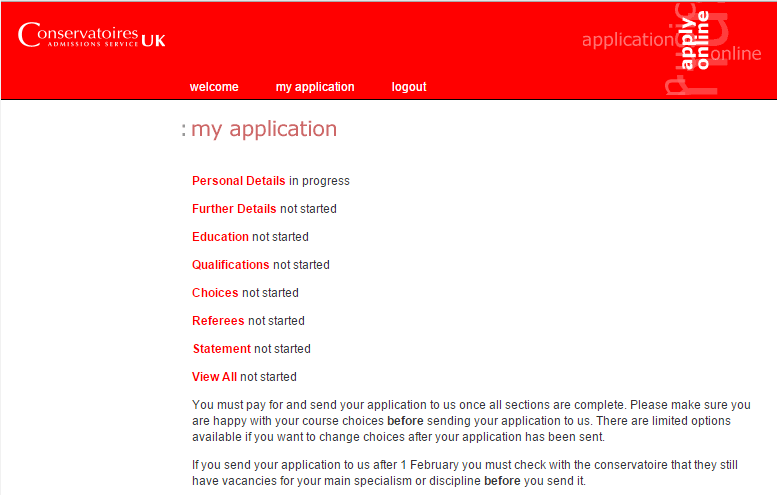 If you have any questions about applying then have a look on our website. You can also get in touch with our advisers on Facebook or Twitter who’ll be happy to help. Get the views of conservatoire applicant Charlotte, who has been sharing her experience in her blog.